We have 12 years to save the world. What do we do now? Wednesday, October 17, 2018, 3:32 PM -	We have until 2030 to prevent the dangerous destabilization of Earth's climate - less than 12 years from now - according to a new UN climate change report, but does this tell the whole story, and what do we do about now? Now that we've had some time to process the United Nation's Intergovernmental Panel on Climate Change (IPCC) Special Report on 1.5°C, it's time to face some harsh realities. Harsh Reality #1: Based on the best scientific evidence available to date, we currently have less than 12 years to mobilize a complete conversion from fossil fuels over to green energy, or we risk dangerously destabilizing Earth's climate. Since the beginning of the Industrial Revolution, from 1880 to the present day, the globe as already warmed by more than 1°C. As a result, we are already seeing the consequences of the extra heat now trapped in the oceans and atmosphere. The Great Barrier Reef, for example, which has weathered countless El Niño events in the past, was decimated by the latest one, due to the added heat in the water. Hurricanes and typhoons are being ramped up to extremes by warmer surface water. 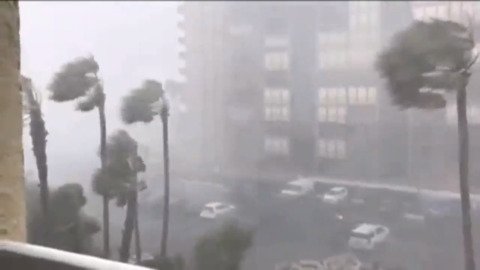 The latest, Hurricane Michael, went from near nothing to a devastating near-Category 5 storm when it made landfall. Florence, although it weakened significantly by landfall, stalled on the Carolina coast, flooding the area with torrential rainfall, similar to how Hurricane Harvey drowned Houston in 2017. NASA is now reporting that the Arctic has lost nearly all its multi-year ice due to global warming. Meanwhile, ice sheets in the Antarctic are quickly headed towards destabilization. Year after year, we are seeing record-breaking heat inundating parts of our world, and this is spreading, causing record droughts and heatwaves. Wildfires, as a result of extreme drought conditions, are consuming our forests and destroying our homes. So, things are bad enough, right now. We're not at the brink of catastrophe, but there are enough alarming trends that we can clearly see the danger. The break point that we're looking at now is that, by 2030, the planet's average temperature is going to reach 1.5°C above what we saw in pre-industrial times. That's another 0.5°C on top of the warming we've seen so far, but in less than one-tenth of the time, and according to the UN report, it will only worsen the risks and impacts of what we're already seeing. Harsh Reality #2: Human activity is the cause of the warming we are seeing. There is no doubt. Based on the overwhelming scientific evidence collected, ever since carbon dioxide, methane and nitrous oxide were first confirmed by laboratory experiment to trap infrared radiation and thus contribute to the greenhouse effect, over 120 years ago, the billions of tons of carbon dioxide being released into the atmosphere each year due to the burning of coal, oil and gas, is the primary driver of the warming we have seen already. This increase in carbon dioxide concentration in the atmosphere not only traps heat on its own, but the rise in temperature that results also increases the amount of water vapour in the atmosphere, and water vapour is a much more powerful (if shorter lived) greenhouse gas. All other considerations - natural or otherwise - have been investigated and ruled out. The only truly meaningful debate about climate change, itself, is just how bad the impacts will be. So, since the warming will continue as long as we continue to burn fossil fuels, the only way we can stop this problem is to stop burning fossil fuels. We need to change the way we get our energy, and we need to do it now. Harsh Reality #3: Even with the dire warning delivered by this report, as with all IPCC climate reports, the warning is not strong enough. Yes, that means that, even as dire as this report's message is, our situation is - more likely than not - even worse. This is not hyperbole. It is a simple fact, based on how these reports are compiled. With each report put together by dozens of scientists, from across the spectrum of climate research, as with all IPCC reports, the final messaging must satisfy them all. Thus, the final warning may contain some of the urgency demanded by those who's research shows evidence of the worst possible impacts from climate change, but it must also take into account those who's research causes them to take a more moderate stance, even if those researchers only represent a minority. This causes the final messaging of the reports to skew towards the weakest form of warnings. Since the report's release, we have already seen responses that say, without a doubt, it is understating the danger we face. In The Bulletin of the Atomic Scientists - the same publication that evaluates world conditions for the famous Doomsday Clock - Mario Molina, Veerabhadran Ramanathan and Durwood Zaelke explain that the report does not take into account the various feedback mechanisms that warming is already causing, and that will be amplified with further warming. "So far, average temperatures have risen by one degree Celsius," they wrote. "Adding 50 percent more warming to reach 1.5 degrees won’t simply increase impacts by the same percentage—bad as that would be. Instead, it risks setting up feedbacks that could fall like dangerous dominos, fundamentally destabilizing the planet. This is analyzed in a recent study showing that the window to prevent runaway climate change and a 'hot house' super-heated planet is closing much faster than previously understood." The loss of Arctic ice is one such feedback 'tipping point', as the exposure of dark ocean water accelerates the warming of the Arctic, which is expected to amplify the melting of permafrost. Permafrost is known to be a vast store of carbon and methane, which if released into the atmosphere, would further accelerate global warming. Even reaching 1.5°C above pre-industrial times will heighten the risk of these feedbacks, the three note, as Arctic ice loss is only one of seven possible climate tipping points we are set to cross between 1°C and 1.5°C. Overshooting that mark to 2°C, even temporarily, they add, risks setting off close to a dozen more tipping points. It's rough going through these points, but there is one positive point the report delivers. "Anthropogenic emissions (including greenhouse gases, aerosols and their precursors) up to the present are unlikely to cause further warming of more than 0.5°C over the next two to three decades (high confidence) or on a century time scale (medium confidence)," the report states. What that means is, if the world stopped burning fossil fuels right now, by transitioning to clean energy, the carbon dioxide and other greenhouse gases that have already been released into the atmosphere up to this point are not likely to warm the planet the additional 0.5°C, either by 2030, or 2050, or even by 2100 (although the confidence of that statement does weaken, the farther into the future they look). So, it's up to us now. We can avert disaster if we act, and act quickly, to make the necessary transition without delay. There are numerous small things that we can all do, in our day-to-day lives, that can help. Drive less, or switch to driving an electric vehicle, or ride a bike, or take mass transit. Reduce the amount of air travel we do. Eat less meat, especially less red meat, as raising livestock is a significant source of greenhouse gases. Buy locally-grown foods and locally-produced products, to cut down on transportation. Buy energy-efficient light bulbs and appliances. Support green energy companies. All of these things are good, but they are not enough. Some attention has been given to the idea of geoengineering, such as solar radiation management, however these could have unacceptable impacts on the environment, and they would not address the problem of ocean acidification. Other technologies that directly remove carbon from the atmosphere, known as carbon sequestration and storage, may be required to help us reach our goal, but we cannot rely on these ideas to pull us back from the brink. We will not make the necessary transition unless we stop burning fossil fuels and switch over to using solar, wind and other forms of clean energy, and large-scale government action (along with support from the public and industry) is the only way we're going to make this change, as quickly as we need to make it. The very first step is for the government to hold polluters accountable for their pollution, by putting a price on carbon. This idea is not popular with some sectors of government and industry, however, a 'revenue neutral carbon tax' has been, so far, the most successful method, as we've already seen in British Columbia. This method provides the strongest incentive to companies to change their behaviour, by impacting their bottom line. At the same time, it drives innovation as industry seeks lower carbon solutions. Additionally, while there have been concerns that carbon pricing will cause more economic hardship for lower-income households, as companies pass on their higher costs to the consumer, a revenue neutral carbon tax actually benefits these households, through tax credits and lower tax rates. Meanwhile, money from carbon taxation can also be used to advance green energy projects, such as solar and wind power, and provide incentives for the public to transition to driving electric vehicles. How do we bring this all about? Vote. Vote to remove those from power who deny there is a problem, or who pessimistically say that there is nothing we can do about it, or who simply attempt to ignore it while pursuing other, less beneficial, policies. Vote to replace those people with representatives who accept the reality of our current situation, yet are still dedicated to tackling the problem, and doing so in the most effective ways possible, so that we can move on to a safer, more sustainable future, not just for ourselves, but for our children and future generations. We've identified the problem, we know what we have to do, and we are now aware of the urgency of the crisis we are in. We've already come together, in the past, to deal with similar global-scale environmental issues (ie: the ozone layer), and we can do so again now. It won't be easy for us. It will take some sacrifices, and it will involve some added expenses, but the truth is, it will never be cheaper for us to act on this, going forward. The longer we wait, the worse off we will be and the more expensive (and more desperate) our solutions will have to be, and as some have warned us, our window to act is rapidly closing. As NASA climate scientist Gavin Schmidt said recently, "The best time to start [reducing emissions] was 25 years ago. The second best time is today."